^ 1.0 1.1 1.2 1.3 1.4 1.5 1.6 1.7 Barbara Tuchman. A Distant Mirror: the Calamitous 14th Century. Alfred A. Knopf. 1978年: 第548頁. ISBN 0345283945 （英语）. ^ 3.0 3.1 David Nicolle、Christa Hook. Nicopolis 1396: The Last Crusade. Osprey Publishing. 1999年: 第36頁. ISBN 1855329182 （英语）. In fact the Crusaders probably numbered some 16,000 men. Traditional Turkish sources give the number of Ottoman troops as 10,000 but when their Balkans vassals were included they may have numbered around 15,000. ^ Robert Hardy. Longbow: a social and military history. Arco Pub. Co. 1977年: 第118頁. ISBN 0668040807 （英语）. ^ 5.0 5.1 Battle of Nicopolis. Encyclopædia Britannica. 2009 [2009-02-18]. ^ 7.0 7.1 R. G. Grant. Battle: A Visual Journey Through 5,000 Years of Combat. Dorling Kindersley. 2005年: 第122頁. ISBN 0756613604 （英语）. ^ Kenneth Meyer Setton、Harry W. Hazard. A History of the Crusades: The fourteenth and fifteenth centuries. Univ of Wisconsin Press. 1975年: 第83頁. ISBN 0299066703 （英语）. ^ Norman Housley. The later Crusades, 1274-1580: from Lyons to Alcazar. Oxford University Press. 1992年: 第76頁. ISBN 0198221363 （英语）. ^ Inc Icon Group International. Ottomans: Webster's Quotations, Facts and Phrases. Inc Icon Group International. 2008年: 第116–117頁. ISBN 0546667562 （英语）. ^ Marshall Cavendish Corporation. Exploring the Middle Ages. Marshall Cavendish. 2006年: 第72頁. ISBN 076147613X （英语）. ^ Timothy E. Gregory. A History of Byzantium. John Wiley and Sons. 2010年: 第372頁. ISBN 140518471X （英语）. ^ Hugh Chisholm. The Encyclopædia britannica: a dictionary of arts, sciences, literature and general information. 第4冊. The Encyclopædia Britannica Company. 1910年: 第780頁 （英语）. ^ Philip Ward. Bulgaria, a travel guide. Pelican Publishing Company. 1991年: 第115頁. ISBN 0882898272 （英语）. ^ 20.0 20.1 Johann Schiltberger. The Battle of Nicopolis (1396), according to Johann Schiltberger. Hakluyt Society. 1427年 [2010-04-23]. （原始内容存档于2009-02-06） （英语）. ^ 21.0 21.1 21.2 Askerı Yapi Ve Savaşlar: Savaşlar (2/11). www.theottomans.org. [2009-02-18] （土耳其语）. ^ Charles L. Tipton. The English at Nicopolis. Speculum. 1962年: 第533–540頁 （英语）. 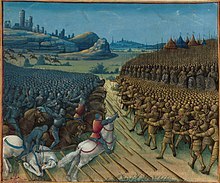 ^ 25.0 25.1 25.2 25.3 I Turchi E L'Europa: Dalla battaglia di Manzikert alla caduta di Costantinopoli: Bayazed I (1389-1402). maat.it. [2010-04-24] （意大利语）. ^ Branimir Anzulovic. Heavenly Serbia: from myth to genocide. C. Hurst & Co. Publishers. 1999年: 第39頁. ISBN 1850655308 （英语）. ^ Nagendra Kr Singh. International encyclopaedia of Islamic dynasties. Anmol Publications PVT. LTD. 2000年: 第293頁. ISBN 8126104031 （英语）. ^ Jackson J. Spielvogel. Western Civilization: To 1500. 第1冊. Cengage Learning. 2008年: 第367頁. ISBN 049550288X （英语）. ^ Kenneth Meyer Setton. The Papacy and the Levant, 1204-1571: The Thirteenth and fourteenth centuries. 第1冊. American Philosophical Society. 1976年: 第347頁. ISBN 0871691140 （英语）. ^ S. M. Ahmed. Islam in U.S.S.R., Turkey and Europe. Abbas Manzil Library. 1956年: 第45頁 （英语）. ^ Richard Vaughan. Philip the Bold: the formation of the Burgundian state. Boydell Press. 2002年: 第69頁. ISBN 085115915X （英语）. ^ Time-Life Books. The Age of calamity: time frame AD 1300-1400. Time-Life Books. 1989年: 第68頁. ISBN 080946442X （英语）. ^ Jean Froissart. Froissart in Britain. J. Nisbet. 1902年: 第201頁 （英语）. ^ Andrei Oțetea. The History of the Romanian people. Scientific Pub. Hoose. 1970年: 第196頁 （英语）. ^ Kate Fleet. European and Islamic trade in the early Ottoman state: the merchants of Genoa and Turkey. Cambridge University Press. 1999年: 第8頁. ISBN 0521642213 （英语）. ^ Mark Pinson. The Muslims of Bosnia-Herzegovina: their historic development from the Middle Ages to the dissolution of Yugoslavia. Harvard CMES. 1996年: 第25頁. ISBN 0932885128 （英语）. Barbara Wertheim Tuchman. A distant mirror : the calamitous 14th century. New York: Alfred A. Knopf. 1978年. ISBN 0345283945 （英语）. Aziz Suryal Atiya. The crusade of Nicopolis. New York: AMS Press. 1978年. ISBN 0404154107 （英语）. R. G. Grant. Battle: A Visual Journey Through 5,000 Years of Combat. London: DK Pub. ISBN 0756613604 （英语）. Thomas F. Madden. Crusades: the illustrated history. Univ. of Michigan Press. 2004年. ISBN 0472114638 （英语）.